Arthur Reid was born in Dublin of the 1920’s. He lived with his parents George and Harriet Reid and his only sister Pat in Drumcondra. In later years George became a Rep for a bacon company. In 1934 his parents decided to purchase one of the newly built houses on the Cabra Road. His parents noticed the construction of a row of new shops on the Cabra Road and after some consideration decided to buy the first shop to be built there in November 1934. The Reid family soon moved into their newly acquired accommodation above the shop. Arthur Reid lived there with his parents until his marriage in 1957 when he purchased one of the very houses his parents had originally come to Cabra to view. In October 1933 the construction of Christ the King church had just been completed and construction began in earnest on the new housing estates around Cabra. The Reid family and their staff operated a counter service which included the weighin of most dry goods and weekly customer accounts. Hams and sides of bacon were hung up on view around the shop. George Reid took a particular interest in tea and developed his own brand of ‘Reid’s Tea’. Reid and Son became a first class grocers and provisions shop. During the ‘Emergency’ years of WWII Reid and Son held the ration books for most of the people in their area. When the North Strand bombings occured on the 31st May 1941 many of the people from that area were rehoused in the newly built Cabra West estate. Their ration books to were lodged with George Reid and Son. There was daily messenger bike delivery service out to the surrounding country beyond Cabra Cross to the Navan Road, Rathoath Road, Castleknock, Finglas and gradually into the newly built housing estates nearby. 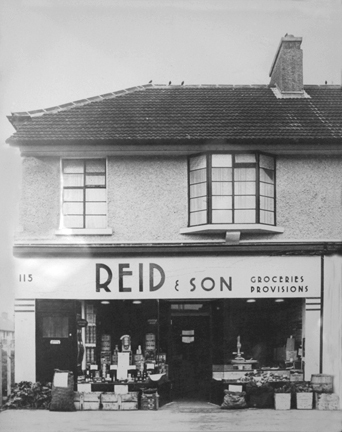 Over the years the premises of Reid and Son was extended and an Off License was introduced in 1959. In February of 1984 the next door newsagents was purchased by Reid and Son. Arthur Reid worked in the family shop all his life and experienced all of the changes and fashions of retailing business. He witnessed the introduction of the Self Service supermarket into Ireland. Arthur Reid was completely committed to his customers and enjoyed many a chat and laugh with them over the years. Arthur Reid or Archie as he was sometimes known sadly passed away in 1994. Seventy five years later the family business and traditions are still being carried on by his son George and his daughter Yvonne who like their father before them are also dedicated to their customers. Many thanks to both George and Yvonne for sharing this information with the Cabra History.Com website.